It’s a commonly accepted concept that writers starting out begin by submitting stories to lesser known publications and, as they build a profile for themselves, work their way up over time to more prestigious venues for fiction, the idea being that all the while they are honing their craft and becoming better writers. And on the face of it, this is generally the case: most writers’ early work appears in smaller magazines and they usually improve as writers with practice. finally worked their way down to the piddling little market that ends up accepting the relevant piece. two reasons why I think writers should do this, one personal and one strategic. The personal reason is to promote within yourself as a writer a modicum of belief in your work and faith that it can sit alongside the work of those you respect in the journals you admire most. This is not to say that you should work at stoking your ego to the point where you are convinced your every word is freighted with genius (a problem I’ll be touching on to different degrees in Part 2, 3, 4 and 5 of this particular series of blogs). No, I’m talking about the cultivation of a persistence of vision essential to any writer planning on being around for the long haul and hoping to eventually build a name for themselves. There’s nothing wrong with believing in yourself. You don’t have to be an obnoxious git with it, wrapping yourself in the aura of a star, distaining others, creating a mystique of glamour. You can be nice and polite and still push yourself. The important thing must always be the work. So why not send it to the New Yorker or a similarly exalted publication (depending on the appropriateness of the specific story of course – something I’ll be talking about in Part 2 of this series)? The strategic reason is perhaps the more important of the two. It relates to building a profile for yourself. This profile doesn’t have to relate solely to what end up getting published; it’s not just about the readers who see your work. It’s also about the editors who become familiar with your name, even if they reject you over and over. You might ask what the point of becoming known to an editor as eminently rejectable is. The fact is if you are serious about your craft, read widely, push the envelope within yourself thematically, stylistically, work hard on character, plot, dialogue and all the other ingredients of storytelling, and most importantly, write regularly (even if only in small amounts), you will get better as a writer. And editors you have been consistently submitting to will see this over time (even if they employ a system of readers where your initial efforts may never get to the editor). It’s all about developing a good working relationship with editors and this starts long before they ever actually accept a story by you for publication. It’s important to bear in mind that editors are human. They are not unassailable, faceless God-like entities, they are not evil despots bent on crushing your feeble efforts (generally), and their opinions are entirely subjective. Just because they don’t like a particular story enough to proceed with it doesn’t mean they won’t like the next one, or the one after that. And all the time they are becoming familiar with your name despite the many hundreds or thousands of submissions they undoubtedly get. In my role as co-editor of Albedo One, I read several hundred stories a year (add to that seven other readers for a grand total of several thousand submissions a year to the magazine). And names and story titles slide from my brain pretty much as soon as I’ve finished reading the stories (unless it’s something I want to consider seriously for publication). But there a couple of dozen writers whose names are stuck in my mind because I’ve read numerous submissions by them before. I have one of two reactions when I see something by one of these writers: ‘Oh no, not again’ or ‘Please, please, please, let this one be really good’. In the case of the first reaction, this occurs when I see yet another story from a writer who has either continually demonstrated a thorough lack of knowledge regarding the kind of fiction we publish (see Part 2 of this series soon for more on this) or has shown no growth in terms of the quality of the writing. In the case of the second reaction, this occurs when I see work by a writer who can clearly write and has come close on several occasions to getting published in the magazine. When I see a story by one of these writers, I’m immediately on their side, rooting for them, wanting their latest submission to be the one that gets in. A consequence of this is that even when I’m rejecting a story of this calibre, I’ll tend to add a comment or two on why it didn’t work for me rather than send out a form rejection. You might think that this doesn’t really matter, as the end result is the same: rejection. But it does matter. As a writer, I have found it gratifying to receive personalised rejections. It convinces me that I’m getting closer to publication in that particular market. And as an editor, I can say in those cases where you receive feedback, you are getting closer. A case in point is Ann Beattie, who has published several dozen short stories in the New Yorker over the last few decades. When she was starting out, she submitted 17 stories to the magazine before she finally got one accepted. I’m not sure if the limit of two submissions per year existed at the time Beattie was submitting, but whatever way you look at it, it’s a serious commitment of time and energy and demonstrates that persistence of vision I mentioned earlier. And as time went by, she started to receive constructive feedback. This was, I’m sure, because of the quality of the work, but I’d also bet it was because her name became familiar to the then editor. The magazine I co-edit is most certainly a fair bit down the pecking order for genre magazines (although rising through the ranks as more and more magazines go to the wall and we persist in existing), and I’ve no doubt that many stories I see have been rejected elsewhere, but that doesn’t matter. I’m not the least bit offended that a writer may have sent his/her story to a better paying or higher profile market prior to sending it to me (unless it’s still being considered by that market – again, part of the subject I’ll be dealing with in Part 2). So I say to you: aim high. You’ve nothing to lose and everything to gain. And very helpful your comments are too! And isn’t it time you sent us a new story? By the way, I find it interesting that there are TWO New Yorker short stories nominated for Bram Stoker awards this year. Interesting. Although I’d imagine you won’t see The New Yorker crowing about it. Stranger things have happened, though. By the way, have you seen the second to latest issue of Granta? It’s a horror special: http://www.granta.com/Archive/Granta-117-Horror/Contents Haven’t read it but I’m planning to. 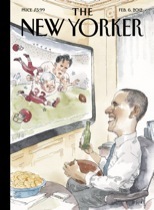 re: The New Yorker – sad but true. And Erin, if you see this–I enjoyed your story in Box of Delights very much. Well done. You should check out Erin’s collection The Floating Order. Top class. And, thanks, John, for posting the link. A great article, John. Another point to bear in mind is that when you do find a market or editor who buys your fiction, you keep sending them new material. Obviously they’re publishing material that pleases their readers, so you will be building up a fan base that will follow you through different projects. Absolutely, Jim. Witness Interzone, Asimov’s and F&SF in this regard. There are several authors who have become semi-regulars in these magazines and it becomes a selling point for the mags to be able to announce a new story by x or y in upcoming issues. Excellent luck if you can become one of these authors. @ John/Erin – I will add “The Floating Order” to my reading list. @ Jim/John – That’s a great point that I hadn’t thought of (building up a fan base through a specific magazine). Interesting.